Hershey's is a household name, worldwide, but did you know that they have a long history of community service? In addition to programs like The Hershey Legacy, which has helped children overcome poverty and difficult life circumstances, Hershey's has been an active fundraising partner of the Children’s Miracle Network (CMN), a non-profit alliance of children’s hospitals dedicated to providing state-of-the-art care, life-saving research and preventative education across North America, for over twenty years. Bloggers may participate in Hershey’s Better Basket Blog Hop and give away virtual Easter Baskets by creating a blog post following the instructions below. Hershey's will donate $10 per each blog post to Children’s Miracle Network (CMN), up to total of $5,000. One blog post per URL counts towards the donation, but you can give as many virtual Easter baskets as you want. The Hershey’s Better Basket Blog Hop will officially begin at 12 AM EST on March 18th and end at 12 PM EST on April 4th, 2010. Blog posts submitted before or after that time period will not be counted. Your blog post link has to be submitted in the comments at BetterBasket.info/BlogHop for the donation to be counted. Copy and paste these rules to your blog post. 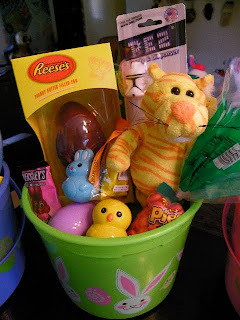 Create a blog post and give a virtual Easter Basket to another blogger - you can give as many Virtual Baskets as you want. Link back to person who gave you an Easter Basket. 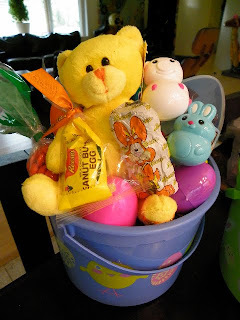 Let each person you are giving a Virtual Easter Basket know you have given them a Basket. Leave your link at http://betterbasket.info/bloghop/ where you can also find the official rules of this #betterbasket blog hop and more information about Better Basket with Hershey’s. Hershey's is donating $10 per each blog participating in the Better Basket Blog Hop to Children’s Miracle Network (CMN) (up to total of $5,000 by blog posts written by April 4th, 2010). Please note that only one blog post per individual blog url will count towards the donation. If you're reading this right now, please consider yourself the proud owner of a Better Basket! And please consider joining in the Better Basket Blog Hop to donate $10 to Children’s Miracle Network (CMN), courtesy of Hershey's. That's such a great program. I liked your Whrrl story too. Reese's Peanut butter stuff is worth sifting through easter grass. I love that you put Pez in them too.